WASHINGTON, DC, May 16, 2011 (ENS) – The United States and China have agreed to cooperate on combating climate change, greenhouse gas observation in China and energy sciences. Talks last week also yielded an agreement to expand efforts to control illegal, unreported and unregulated fishing as well as establish regular bilateral consultations on fisheries conservation and ocean management. The agreements at the third U.S.-China Strategic and Economic Dialogue meeting held in Washington, grew out of talks between U.S. President Barack Obama and Chinese President Hu Jintao during Hu’s state visit in January. The two presidents pledged to establish a framework of comprehensive cooperation between the two countries. “Today, the two leaders’ vision has become reality,” said Chinese Vice Finance Minister Zhu Guangyao on Tuesday at a press conference after the Dialogue. 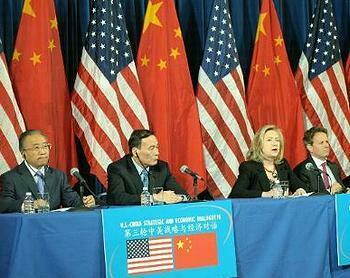 The two-day Dialogue was co-chaired by U.S. Secretary of State Hillary Clinton and Treasury Secretary Timothy Geithner with Chinese Vice Premier Wang Qishan, and State Councilor Dai Bingguo. Under the greenhouse gas observing agreement, the Chinese Meteorological Administration and the National Oceanic and Atmospheric Administration, NOAA, will strengthen joint research programs to develop accurate and reliable capabilities for observing and understanding the behavior of greenhouse gases in the atmosphere, NOAA explained in a statement. A better understanding of the exchange of these gases among the land, the oceans and the atmosphere will improve greenhouse gas management decisions in both countries, NOAA said. The two delegations held “a fruitful meeting” of the Climate Change Policy Dialogue and decided to work constructively together to ensure the comprehensive, effective and sustained implementation of the UN Framework Convention on Climate Change, including through implementation of the agreements reached in Cancun, and to achieve a positive outcome at the UN Climate Change Conference in Durban, South Africa. The negotiators decided to further strengthen the mechanisms for climate change policy dialogues and related cooperation, strengthen communications at various levels, and exchange views on issues under international climate negotiations and on domestic policies to address climate change. Negotiators discussed a joint action plan to implement the newly signed protocol agreement for cooperation between the U.S. Department of Energy and the Chinese Academy of Sciences in high energy physics; nuclear energy sciences, including fission and fusion related sciences; basic energy sciences, biological science, and environmental science research and development. On fisheries cooperation issues, the United States and China currently work multilaterally in various regional fishery management organizations to manage shared fish stocks and participate in other global organizations that protect ocean resources. The bilateral consultations agreed in Washington are expected to better coordinate their positions to achieve common goals in those organizations and establish an enhanced dialogue to help bridge any differences. “This joint commitment to consult on fisheries management and enforcement will strengthen the U.S.-China relationship on fisheries management and ensure more coordinated and comprehensive management of the fish and living marine resources on which both of our economies and fishing industries depend,” said Russell Smith, NOAA deputy assistant secretary for international fisheries. 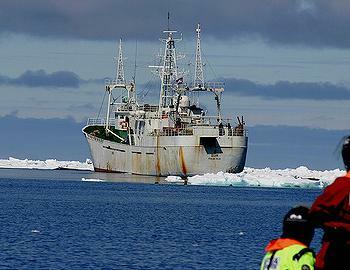 The fisheries consultations will focus on conserving and managing marine living resources; expanding current efforts in high-seas fisheries enforcement; and combating illegal, unreported and unregulated fishing, known as IUU fishing. The two countries will work towards preventing IUU fish and fish products from entering international markets; collecting data on species of concern in order to ensure their sustainable management and conservation; and preventing illegal or unintended take of sea turtles and other protected marine species. The United States and China also agreed to formulate a U.S.-China 2011-2015 Framework Plan for Ocean and Fishery Science and Technology Cooperation, and, in the near future, to further develop a U.S.-China large-scale joint program for the Indian and Southern Oceans. The two countries also decided to hold the second round of bilateral discussions on Law of the Sea and polar issues in Washington, DC later this month. Negotiations will continue on combating illegal logging and associated trade in illegal timber later this year under a Memorandum of Understanding already signed by both countries. Senior officials from both countries will participate in a U.S.-China Joint Commission meeting on Science and Technology Cooperation in Beijing in the first half of October 2011. And also in October, the Joint Working Group of U.S.-China Agricultural Science and Technology Cooperation will meet in New Mexico. The two sides also jointly expressed their support for the Solar Decathlon organized by Peking University. In 2013, China will host its inaugural Solar Decathlon competition with teams from international universities. Each team will design and build a house that uses solar energy as the sole energy source for maintaining the operations of daily life. The Solar Decathlon China competition will be hosted by China’s National Energy Administration and the U.S. Department of Energy, organized by Peking University, and supported by companies including Applied Materials of the United States. Launched in the United States in 2002, the Solar Decathlon has been held about every two years. The competitions have 10 contests, including energy conservation, architecture, environmental appeal, and energy independence – making each competition a true decathlon.